Yakshagana performances in K'taka come under EC scanner: Is it fair to control an art? Yakshagana artistes say that the art form has been used for political messaging in the past, too, and that the trend isn't new. With the Lok Sabha elections only a few weeks away, the Election Commission is gearing up to ensure free and fair polling across the country. And in Karnataka, the traditional art form of Yakshagana has come under the scanner of the EC. Troupes performing in Dakshina Kannada and Uttara Kannada districts of Karnataka have been advised to inform election officials about performances. "We have asked Yakshagana troupes to inform us about any performances because in that case, if people make a complaint, then we will not have any prejudice while investigating it. This is just so that we are kept in the loop about it," Uttara Kannada Deputy Commissioner K Harish Kumar told TNM. A similar advisory has been given to Yakshagana troupes in Dakshina Kannada as well. Election officials will also check whether Yakshagana performances are being conducted by members of political parties and whether audiences are given free meals or gifts in an attempt to woo them. The decision to bring Yakshagana performances under scrutiny has been taken after the Model Code of Conduct came into effect on March 10. But is it reasonable to control an art form? Yakshagana, the traditional art form in which performers combine dance, music and dialogue to mostly tell mythological tales, is popular in the coastal districts of Karnataka. It had earlier come in the Election Commission's radar in the run-up to the 2018 Karnataka Assembly elections. At the time, nodal officers sacrificed their sleep to attend overnight Yakshagana performances in Brahmavar, Kota and Amasebailu in Udupi district. The heightened vigilance from the election officials came after a complaint was registered against the Kateel Sri Durgaparameshwari Prasadita Dashavatara Yakshagana Mandali in Kateel in neighboring Dakshina Kannada for taking a dig at Congress President Rahul Gandhi. In a sequence performed by Poornesh Acharya, the protagonist's words, "Ivanaarava, ivanaarava, ivanaarava” and “Iva nammava, iva nammava, iva nammavanendenisayya" (Don't ask who he is, accept him as one of our own) caught the election officials' attention. The sequence was supposedly a reference to Rahul Gandhi reciting a vachana of 12th century social reformer Basavanna in an election speech in Belagavi. The troupe was subsequently asked to show scripts of performances to election officials beforehand while officials also attended their Yakshagana performances. The same troupe has also performed Yakshagana programmes to propagate the welfare initiatives introduced by Prime Minister Narendra Modi. Several Yakshagana performers and observers close to the art form noted that performances in the run-up to the elections are often infused with political messaging. 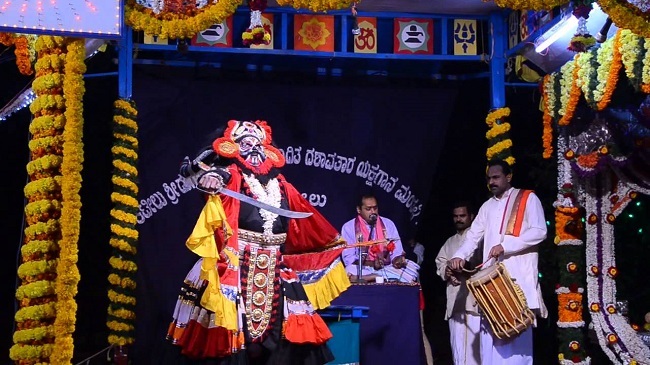 "There have been Yakshagana performances that have praised Narendra Modi and his schemes and have also made references to the terror attack in Pulwama. This increases during the time of elections. Yakshagana performances are no longer restricted to stories from mythological texts. 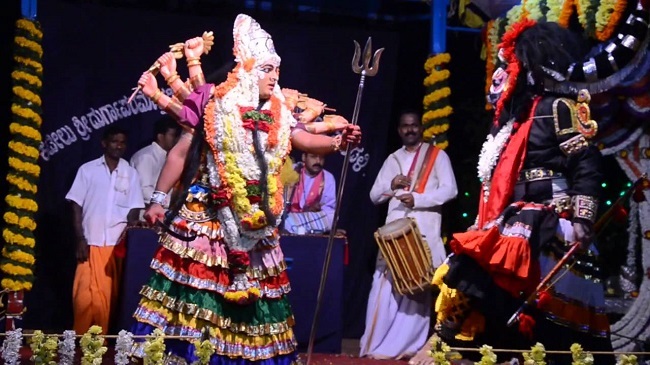 There are an increasing number of Tulu performances that draw references from popular culture,"says Diwakar Das Kavalkatte, a Yakshagana performer from Dakshina Kannada. It is not just the BJP that is benefiting from the political messaging in Yakshagana performances. According to a research by Shruthi, a student of Nitte Insititute of Communication (NICO) in Mangaluru, Yakshagana has been used to promote various social schemes introduced by the Siddaramaiah-led Congress government in the past, including the Annabhagya and Ksheerabhagya schemes. "Yakshagana performances highlighting these welfare schemes were performed in schools in Udupi district," says Shruthi. Election officials are also looking to enforce the Supreme Court's guidelines and ensure that loudspeakers are not used after 10 pm. The drive to ensure that Yakshagana performances adhere to the Model Code of Conduct, however, has irked traditionalists. "It is not new that political messages are included in Yakshagana performances. In a performance in Suratkal in 1978 during the time of Emergency, a Yakshagana troupe had cleverly designed a play within a play. The protagonist in the play proclaimed, 'I want to organise a play but where do I do that? I went to heaven and there Devaraja was king and he was a worshipper of Goddess Indira'. The protagonist was referring to real life characters Devaraj Urs, who was the Karnataka Chief Minister at the time and Indira Gandhi, who was the Prime Minister at the time," explains Shantharam Kudva, a Yakshagana artist from Moodbidri. Shantharam recalls a time when politicians attended Yakshagana performances and laughed along with the audience to jokes about their own party. He feels that the political messages in Yakshagana performances today are blatant and do not blend well with the story being told. "If it is fitting the story and not directly asking voters to vote for a particular party, I don't see a problem in it. It is a stage performance and humour is an important part of it," he adds.